I have a new design that is in the March issue of Happily Hooked Crochet Magazine, just released today! The Rosebud Baby Blanket is a soft and sweet baby blanket with an easy pattern stitch that creates the appearance of tiny rose buds. You can visit the Happily Hooked website to purchase this issue. You can see some of the other designs included in the issue on Ravelry. I just created a new snuggy out of DMC Top This! yarn. I really like this yarn. Patterns work up really fast and the little animals are really cute! The pattern is available on Ravelry or Craftsy. I recently discovered DMC Top This! yarn and couldn’t wait to get my hands on it. It comes with a cute little stuffed animal topper to adorn the top of a hat or add to a blanket — or whatever other creative idea you can come up with. 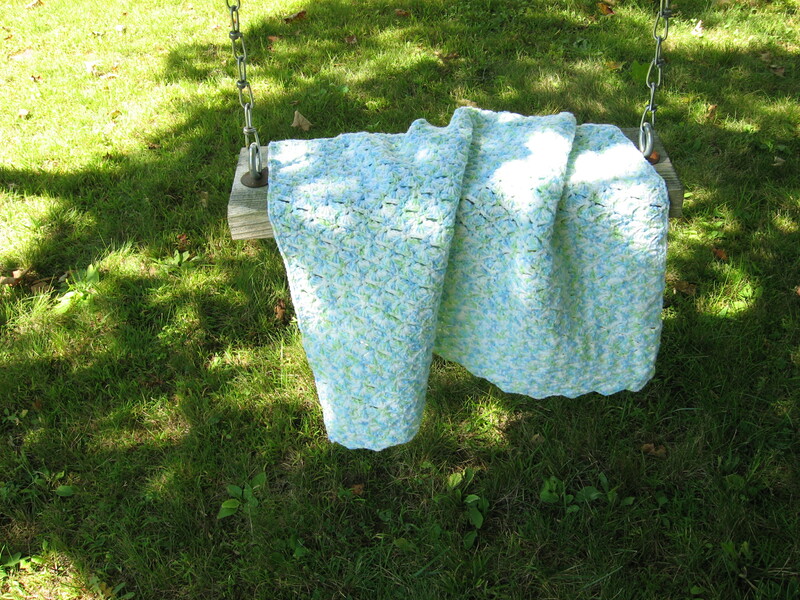 I made this snuggle blanket which is going to be a great gift for a little one I know. I made this in an evening. If you would like the pattern, you can download it for free from my Ravelry store, or Craftsy if you prefer. I’ve just added bunch of my out-of-print crochet patterns to Ravelry and Craftsy, so I hope you will go and check them out. Patterns range from totes and scarves to baby blankets and throws. Costs range from FREE to $3.99. Visit my Ravelry Store or Crafty Store to check them out. You can also find many of my patterns available as Kindle downloads on Amazon. The Shells & Lace Baby Blanket is a lightweight, yet sturdy baby blanket that is the perfect size for travel. It’s a perfect transitional project for the beginning crocheter to step up to a more challenging project with its shell pattern stitch. 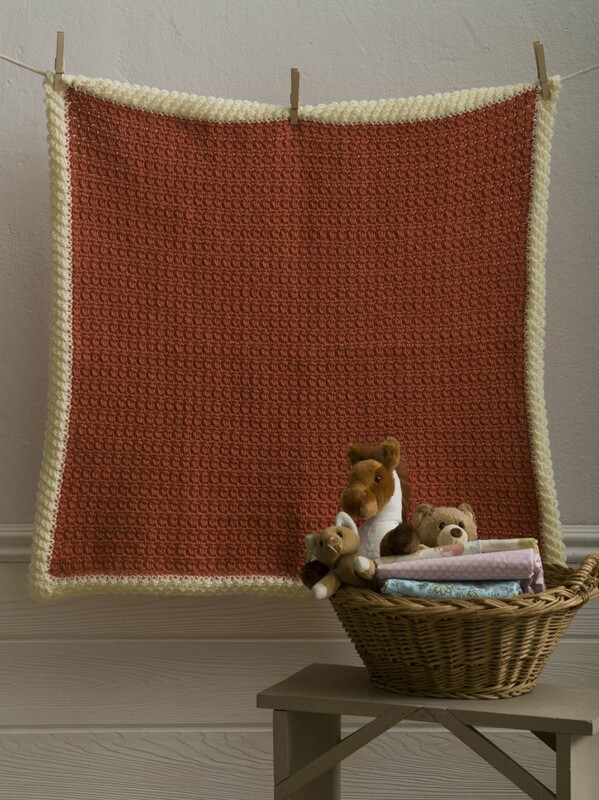 This blanket is made with just one skein of Bernat Baby Coordinates yarn. You can purchase this pattern on Ravelry or Craftsy. This is a crochet pattern I did a while back for Crochet 1-2-3 (no longer in publication) for a Quick ‘n Simple Wooby. The design is in support of Newborns in Need, which distributes items free of charge to babies in the United States. 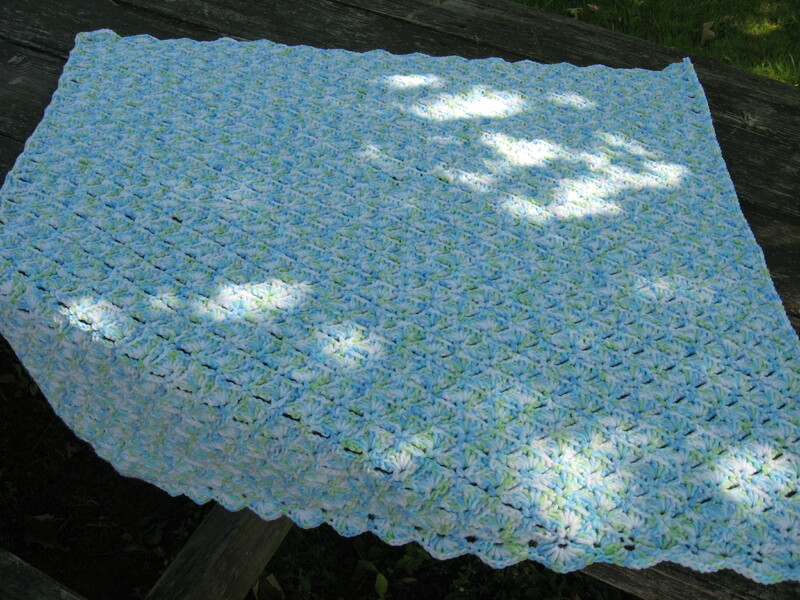 FINISHED MEASUREMENTS: Blanket measures approximately 15″/38cm square. GAUGE: In pattern, 12 sts and 8 rows = 4″/10cm. Gauge is not critical for this project. NOTE: For a larger baby blanket, make as many chains as needed ensuring that you begin with an odd number of chains. Sample is made using 2 balls of #5106 Sleepytime Deborah Norville Serenity® Baby from Premier® Yarns. Row 1 (WS): Sl st loosely in 3rd ch from hook (beginning ch counts as first hdc), *hdc in next ch, sl st loosely in next ch; repeat from * across—44 sts. Row 2: Ch 2 (counts as first hdc here and throughout), turn, sk first sl st, *sl st loosely in next hdc, hdc in next sl st; repeat from * across to beginning ch, sl st loosely in top of beginning ch. Repeat Row 2 until piece measures about 15″/38cm or desired size. Fasten off. I had 4 designs in issue 12 of Crochet 1-2-3. In my last post I provided the link for the free pattern to my Quick ‘n Simply Wooby. On that note, Crochet 1-2-3 and Knit 1-2-3 have become available at many more locations. I have found them not only at my local Walmart, but also at several of my local grocery stores. They are also available at other craft chains. So it shouldn’t be too hard to find a copy.